bl.uk > Online Gallery Home	> Online exhibitions	> Asia, Pacific and Africa Collections	> Khandalla, Bombay Pres. 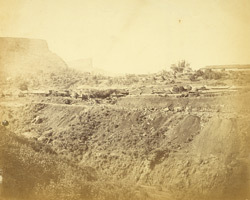 A photograph of a view of Khandala, near Bombay from the 'Vibart Collection of Views in South India' taken by an unknown photographer about 1855. Khandala is a small hill station in the state of Maharashtra within the Sahyadri Mountains. In the 19th Century such resorts became the favoured retreats of the British where they could retreat from the harsh Indian summers. Today the town still provides a popular getaway from the cities of Mumbai and Pune.